BRIDGETOWN, Barbados (AP) — An outstanding double hundred from West Indies captain Jason Holder and a supporting century by Shane Dowrich left England humbled for the second day in a row and battling to avoid a huge defeat in the first test on Friday. MIAMI (AP) — Forecasters say Tropical Storm Kirk is on a path to dump heavy rains that could bring dangerous flooding to the eastern Caribbean. At 2 p.m. EDT, the National Hurricane Center said the center of Kirk was about 60 miles (96.5 kilometers) northwest of Barbados. It had maximum sustained winds of 50 mph (80 kph) and was moving ahead at 14 mph (22.5 kph). NEW YORK (AP) — A former member of the Parliament of Barbados has been arrested in Florida on conspiracy and money laundering charges filed in Brooklyn federal court. Donville Inniss, a legal permanent U.S. resident and ex-member of the Barbados parliament and a former industry minister there, was arrested Friday. U.S. Attorney Richard Donoghue announced the arrest, saying an indictment was unsealed Monday. BRIDGETOWN, Barbados (AP) — Suspended Australia captain Steve Smith has signed with the Barbados Tridents in the Caribbean Premier League as a replacement for Shakib Al Hasan. Smith is serving a 12-month ban imposed by Cricket Australia for his role in a ball-tampering scandal during a test series in South Africa in March that plunged his national team into disarray. MIAMI (AP) — A passenger with a python hidden inside an external hard drive was stopped from boarding a Florida plane headed to Barbados. BRIDGETOWN, Barbados (AP) — Sri Lanka has drawn its test cricket series with the West Indies 1-1 after winning the third and final match by four wickets on Tuesday at Kensington Oval. The first day-night cricket test in the Caribbean was in the balance when Sri Lanka resumed Day 4 on 81-5 in its second innings, chasing 144 for victory after dismissing the hosts for just 93. Sri Lanka had a tense start when it quickly lost Kusal Mendis (25) without adding any runs. BRIDGETOWN, Barbados (AP) — Sri Lanka captain Dinesh Chandimal will miss the third and final test against the West Indies which starts on Saturday after his appeal against a one-match ball-tampering suspension was rejected. NEW YORK (AP) — Rihanna is mourning the death of her cousin and calling for an end to gun violence. PORTSMOUTH, Va. (AP) — The crew of the U.S. Coast Guard Cutter Legare (la-GREE) is back in Virginia after a 45-day deployment in the Caribbean. The Coast Guard says the Legare returned to Portsmouth on Sunday. The deployment was part of Operation Unified Resolve, and included patrols to prevent drug smuggling and illegal immigration into the U.S.
Rihanna has thanked the "community" in her hometown of Bridgetown, Barbados, after officials named a street after her. The 29-year-old singer grew up in the country's capital Bridgetown, and in honour of her chart-topping and award-winning success, the street she lived on as a child has had its name officially changed to Rihanna Drive. The scope and scale of misery caused by Irma continues to grow, including its human toll. Irma, at one point the most powerful hurricane ever recorded in the open Atlantic, has claimed the lives of dozens of people across the Caribbean and southeastern United States. BRIDGETOWN, Barbados — Authorities in the eastern Caribbean warned residents to stay indoors as Tropical Storm Harvey brought heavy winds and rain to the area Friday on a path expected to take it to Central America next week. Harvey was expected to cross through St. Vincent and the Grenadines and then over the Caribbean Sea. A tropical storm warning was also in effect for Martinique and St. Lucia. BRIDGETOWN, Barbados (AP) — Authorities in the eastern Caribbean warned residents to stay indoors as Tropical Storm Harvey brought heavy winds and rain to the area Friday on a path expected to take it to Central America next week. BRIDGETOWN, Barbados (AP) — Shops and government offices are closing early in Barbados and flights have been canceled as Tropical Storm Harvey approaches the eastern Caribbean. The U.S. National Hurricane Center in Miami said Harvey had maximum sustained winds of 40 mph (65 kph) on Thursday as it headed toward Barbados and St. Lucia. It was on track to pass near or over Barbados early Friday on a path toward Central America. COLUMBIA, S.C. (AP) — A fugitive who's been on the run for months from Barbados authorities was arrested in South Carolina on charges that he scammed elderly victims out of more than $100,000, federal officials said Sunday. The U.S. Marshals Service said in a news release that Hainsley DaCosta Browne was arrested in Fairfield County, South Carolina, hours after a media alert was sent Friday asking for the public's help. Lore has it that Barbados got its name from the Bearded Fig Tree, spotted in 1536 by Por­tuguese sea captain Pedro a Campos, who called the island that held them “Os Bar­bados,” or “The Bearded.” If he’d been prescient as to the future of the Caribbean spot, he’d have named it for its ability to serve as the perfect island paradise. Bostonians have long been onto this. In fact, we’ve made Barbados a vacation destination for centuries. SAN JUAN, Puerto Rico (AP) — The eastern Caribbean is bracing for heavy winds and rain after Tropical Storm Don formed Monday in the Atlantic Ocean. A tropical storm warning was in effect for Grenada, while a tropical storm watch was in effect for the nearby islands of Barbados, St. Lucia and St. Vincent and the Grenadines. CARICOM leaders are in a state of shock, dismay and disbelief after the United States accused 14 of the 15-member states of money laundering. News reports indicate that this accusation was included in the March report from the International Narcotics Control Strategy of the U.S. Department of State. John Wesley of the United Methodist Church once said, “Do all the good you can, by all the means you can, in all the ways you can, in all the places you can, at all the times you can, to all the people you can, as long as ever you can.” Caribbean people! We have yet another reason to be proud of Ri-Ri because that is exactly what she has done. Rihanna was born Robyn Rihanna Fenty on Feb. 20, 1988 on the beautiful island of Barbados. BRIDGETOWN, Barbados (AP) — West Indies collapsed in the evening session to reach 264-9 at stumps on day four of the second test for a 183-run lead over Pakistan on Wednesday, setting up a potentially intriguing final day. Pakistan legspinner Yasir Shah took his 10th test five-for, finishing with 6-90, including the key wickets of Shai Hope for 90 and Kraigg Brathwaite for 43. Hope was caught high at cover by Azhar Ali as West Indies went from 235-4 to 236-7 after tea at Kensington Oval. BRIDGETOWN, Barbados (AP) — Pakistan dominated the third day of the second test against West Indies on Tuesday, leaving the hosts on 40-1 in their second innings at stumps and still 41 runs behind on a deteriorating wicket. Shimron Hetmyer (22 not out) and Kraigg Brathwaite (8 not out) steadied the innings after Pakistan's Mohammad Abbas claimed Keiran Powell (6). The opener's sharp inside edge was well caught behind by Sarfraz Ahmed, diving wide and low. BRIDGETOWN, Barbados (AP) — Roston Chase scored his second test century and Jason Holder his sixth test 50 as West Indies dominated the evening session on day 1 of the second test against Pakistan to reach 286-6 off 89 overs at stumps on Sunday. CAMBRIDGE, Mass. (AP) — Grammy Award-winning singer Rihanna finally "made it to Harvard" to be honored as the university's 2017 Humanitarian of the Year. She received a standing ovation as she accepted the award on Tuesday. "So I made it to Harvard," she said, flipping her long ponytail and striking a pose as the crowd erupted into cheers. "Never thought I'd be able to say that in my life. But it feels good." CAMBRIDGE, Mass. (AP) — Rihanna has been named the 2017 Harvard University Humanitarian of the Year. The Grammy Award-winning singer will receive the Harvard Foundation's Peter J. Gomes Humanitarian Award at a ceremony scheduled for Feb. 28. BRIDGETOWN, Barbados (AP) — Britain's Prince Harry joined Rihanna in celebrating 50 years of independence for her native Barbados. 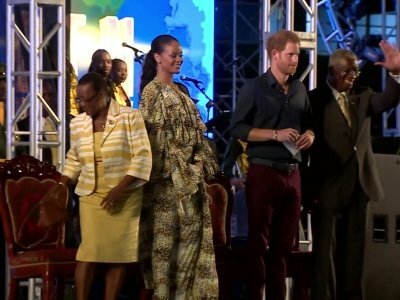 The prince, visiting the sixth of seven nations on a two-week Caribbean tour, and the singer shared the stage Wednesday night with the prime minister during a concert and dance performance marking the date the island broke away from Britain. LONDON (AP) — Prince Harry will return next month to Barbados, where he previously charmed locals with his dance moves. On his last official visit to the island, in 2010, the prince was keen to embrace local culture and attempted the Calypso at a fund-raising event. His Caribbean island tour, where he will be representing his grandmother, Queen Elizabeth II, will include visits to Antigua and Barbuda and St Lucia. GEORGETOWN, Guyana (AP) — Officials say Prince Harry will make his first official visit to several Caribbean nations later this year when some of them will be celebrating the anniversaries of their independence from the United Kingdom.